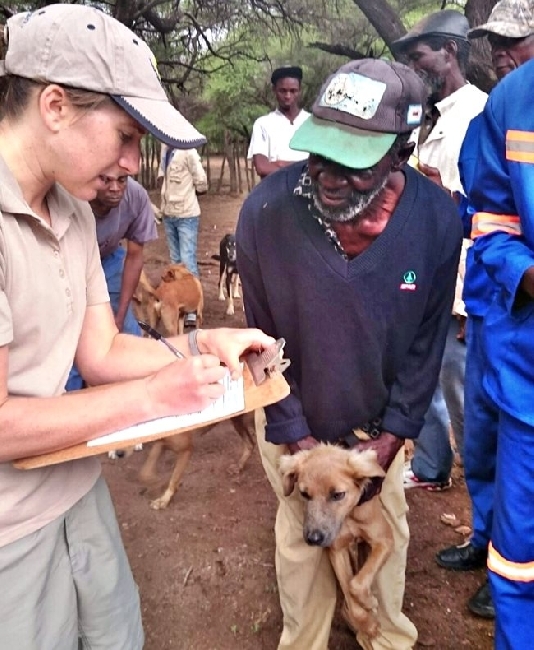 This past week, 2 March 2015 - 7 March 2015, our long term partners, Optima Community Veterinary Clinic held a rabies prevention campaign in the Bubye conservancy, Zimbabwe, on the South African border. 1000 dogs vaccinated in 5 days . The team worked long hours in this vast rural area where a lion was tested positive for rabies end last year. Rabies is 100% fatal, but 100 % preventable if your animals are vaccinated. area, after a lion tested positive for rabies recently and had to be euthanized. required import permits and Vets for change South Africa headed off to Zimbabwe. covering vast distances each day with the use of their Land Cruiser. rural area about rabies and explaining the importance of vaccination. the morning went on and the word spread, more and more dogs and their owners arrived. managed to answer questions on the subject at the end of the morning. word could be spread, enabling as many people as possible to bring their dogs to us. due to the over population. support of Dr Mike and his assistants. and along with his colleagues, helping to organise the villages we attended. for her much valued support and hard work each day throughout the project. Ranch for sponsoring the fuel, allowing us to cover such a vast area.